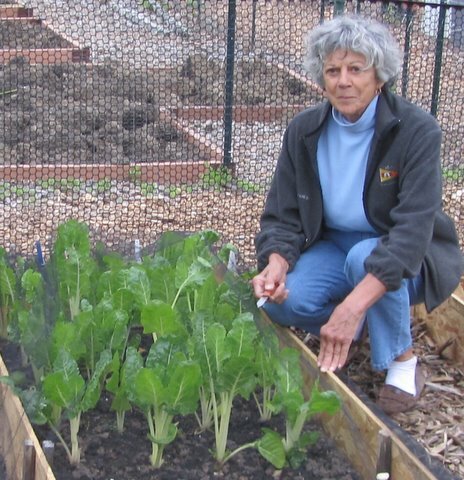 Barbara Billek, who gardens at the Columbia Gardeners, Inc., Westside Garden Plots, has been harvesting Buttercrunch, Deer Tongue, and Parris Island Cos lettuce for several weeks now, while most of us gardeners in Central Maryland have been struggling to plant our lettuce seeds in rain-saturated soil. What’s her secret for jump-starting her spring garden? 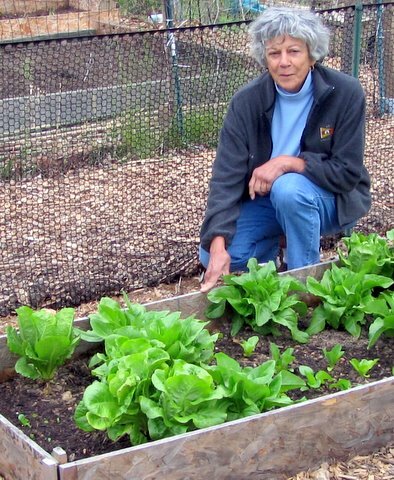 How did Barbara’s lettuce survive the freezes and snows of Winter 2010-2011? Does Barbara use hoops or some sort of a structure to support the cover? When does she take off the cover? “This year I took it off March 2,” she said. “You can see the difference the row cover makes.” She pointed out three sowings of the same lettuces. After two months, seeds she sowed on March 13 are plants about an inch and a half tall. After nearly a month, seeds she sowed April 17 are plants about a half inch tall. Seeds she sowed September 26 are now plants about 10 inches tall. Do row covers get other veggies through the winter? Thank you, Barbara, for this gardening tip—and for the gift bag of lettuce. Ellen and I have already enjoyed a mixed salad for dinner and put some of the deep-red leaves on our Gardenburgers at lunch. The lettuce is delicious. The lettuce looks great. Raised beds look nice too… and just the right thickness and height for pinning the cover. We can attest that the lettuce tastes as great as it looks! I also overwintered lettuce. It's not as far along as yours, but I'm in zone 5. Yours looks awesome. 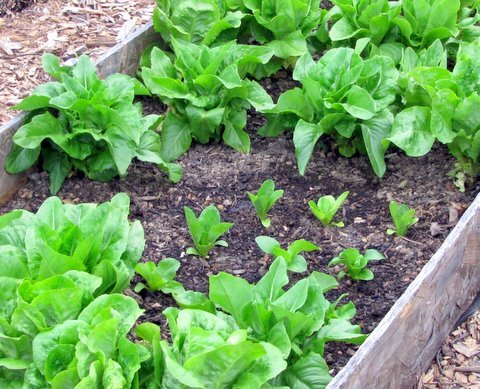 Another way to eat early lettuce in the spring is to winter sow it in containers. I've been eating lettuce in zone 5 for about a month now. Winter sowing is a bit more work because you have to sow the containers in the winter and put them out in the snow. But for me it is worth it because I like fresh salad greens. I was just thinking today about what I need to do next year to get my lettuce started earlier. I did wintersow some, but they did not do terribly well. I plan on giving this a try…your lettuces look fantastic! 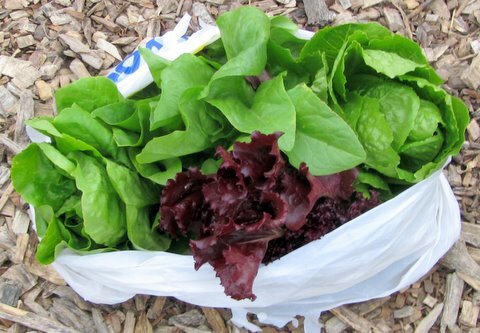 Bill: Wow, harvesting lettuce in Zone 5 already. That is impressive. Do you sow in containers, put them out, and then the seeds germinate as soon as the snow melts and there is sufficient warmth for the seeds to grow? At some point, it would seem to me that actual plants–such as Barbara overwinters–would be wiped out by low temperatures. Is there a reason you sow in containers rather than in actual garden soil? Sounds like a good method. I'm afraid our slugs would eat all the tiny seedlings throughout that time. I'll have to think about trying your method though. Now if you can tell me how to do that in Harmony, FL that would be great.